Click 'Tools' in the menu bar to bring up the tools menu. 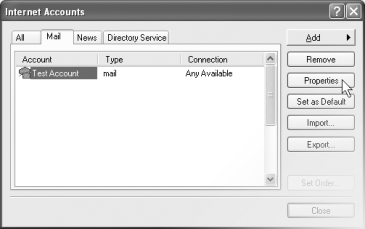 Click 'Accounts' in the Tools menu to open the Accounts window. You may have to click the double-arrow at the bottom of the menu to expand the menu to display this option. Click the 'Mail' tab in the Internet Accounts window to only see email accounts. Click your Lawyers Online email account. 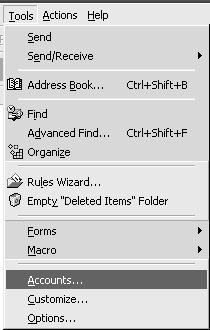 Click Properties to open the Account Properties window. Click the 'Servers' tab to see the servers settings. 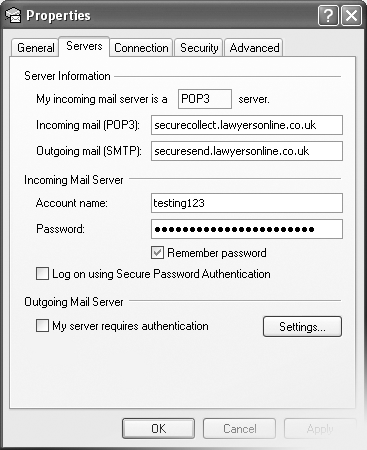 Make sure that your Incoming mail server is set to securecollect.lawyersonline.co.uk. Make sure that your Outgoing mail server is set to securesend.lawyersonline.co.uk. Ensure the 'Log on using Secure Password Authentication' box is NOT ticked.